The Hanover Regional Dispatch Center received a call at 03:16 hours this morning from an employee of Hypertherm, Inc., located at 21 Great Hollow Road. The call reported a large outdoor fire that was “up on top of the mountain”; however, they could not provide a specific location. 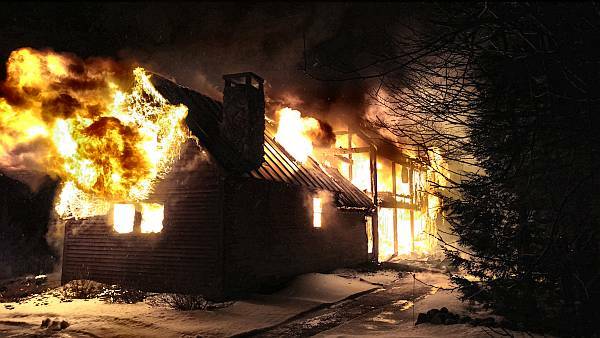 The Hanover Fire Department was dispatched to the Stevens Road area and while enroute, the Hanover Police Department confirmed that there was a fully involved structure fire at 65 Stevens Road. Lebanon, Lyme, Canaan, and Enfield, (NH) and Hartford, Norwich, and Thetford, (VT). The first arriving fire units confirmed that a very large post and beam residential structure was consumed by fire and that a large portion of the roof structure had collapsed. Firefighters were able to save a detached two-car garage. The Hanover Fire Department and the State of NH Fire Marshal’s Office have completed their initial investigation. The exact cause of the fire remains undetermined at this time. There were no reported civilian or firefighter injuries.